WATERLOO – Wilfrid Laurier University scientists have been playing a key role in The Canadian Rivers Institute’s (CRI) efforts to answer questions and develop solutions to the issues facing the world’s rivers. 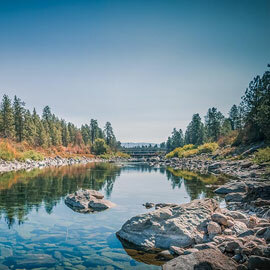 The CRI, in honour of its 15th anniversary and World Rivers Day on Sept. 25, has issued a report highlighting its achievements and plans for the next 15 years. The CRI is a network of 22 science directors and their multi-disciplinary research teams based at 14 universities and institutions across Canada and abroad. It has evolved into a world leader in applied aquatic science that, in addition to addressing issues affecting the world’s rivers and estuaries, trains the next generation of aquatic scientists. “Canada holds a substantial amount of the world’s fresh water, and we therefore have a global caretaker responsibility to that water and the ecosystems within it,” said MacLatchy. MacLatchy is one of five CRI-affiliated professors at Laurier. She also works with three CRI-affiliated graduate biology students in her lab – Samantha Deeming, Grant Harrison and Robert Rutherford – all Laurier alumni who remained at Laurier to do more graduate work to take advantage of the CRI network, scholarships, and professionalization track. MacLatchy and her team help to safeguard human and aquatic life from the detrimental effects of water contamination and stressors from sources such as climate change, sewage, oil and gas exploration, and pulp and paper mills. Their research identifies source endocrine disrupting substances (EDSs) contaminants and looks at how environmental EDSs impact the hormonal systems in fish, altering their reproduction, development, and growth. The results help industry to remediate the compounds released through the pulp and paper industry and sewage treatment’s waste water. Read more about MacLatchy’s research. Jim McGeer is a Laurier biology professor, associate director at LIWS, and a CRI associate. His research projects focus on water and sustainable environment. Specifically, he looks at inorganic contaminants, their impact on sensitive aquatic organisms and how environmental factors within ecosystems and watersheds influence responses. He translates the results of his research to inform environmental policy, working with industry as well as Environment and Climate Change Canada, the Ontario Ministry of Environment and Climate Change and the Environment and Natural Resources Department of the Government of the Northwest Territories. Read more about McGeer’s research. Michael Wilkie is an associate professor of biology at Laurier and a CRI associate. He and his team examine how ammonia and oxygen deprivation alters brain function and metabolism in fish, as well as how fish gills are affected by exposure to toxins. The evolutionary history of different fish species affects how they react to changes in conditions and chemicals found in our modern waterways. Wilkie also studies the affects of 3-trifluoromethyl-4- nitrophenol (TFM), a pesticide used to control sea lamprey populations in the Great Lakes, but which has resulted in the death of thousands of host fish such as trout and whitefish, upon which the lampreys prey. Read more about Wilkie’s research. Scott Smith is a chemistry professor at Laurier and a CRI associate. Smith’s Chemistry Lab for Environmental Aquatic Research (CLEAR) focuses on metal contamination in water sources and nutrient overabundance in water discharge. His research analyzes the forms of metal at particular sites to determine how much harm they may cause animal and plant life. These data provide valuable information to policy makers and those tasked with cleaning up metal contamination. CLEAR’s nutrient-related research optimizes phosphorus removal during wastewater treatment and captures nutrients from waste water to reuse them as safe and inexpensive fertilizers. His research also informs how engineers design and operate wastewater treatment plants for nutrient removal. Read more about Smith’s research. Kevin Stevens is an associate professor of biology at Laurier and a CRI associate. He researches wetland plant ecology, both in Northern Canada and in Southern Ontario. He studies everything from streams, creeks, ponds, lakes or marshland and the processes and patterns of the ecological communities. Up north, his research team monitors the success of restoration efforts at various mines, helps to develop restoration plans for the future and tries to understand how the mine has impacted natural wetlands to plan better for future restoration. In Southern Ontario, his team focuses on the Grand River Watershed where he analyses the effects of water quality on vegetation as well as risks facing rare plant species. Read more about Stevens’ research. Developing further cutting-edge biomonitoring tools and incorporating them into assessments of river health. “It is important that Laurier’s CRI scientists focus on their role as Canadian researchers to help protect our local environments,” said MacLatchy. Read more about the CRI, its past 15 years and its activities. To learn more about Laurier’s water-based research activities, visit the Laurier Institute for Water Science, the Cold Regions Research Centre, and the Centre for Cold Regions and Water Science.